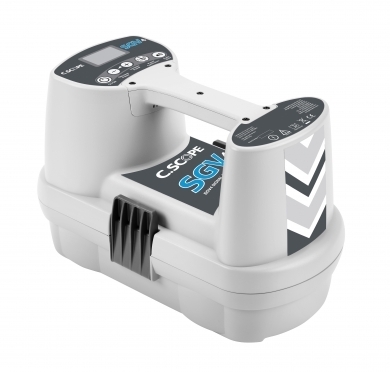 The C.Scope SGV4 Signal Generator is designed for use alongside a CXL4 or DXL4 Cable Avoidance Tool. It enables significantly more underground utilities to be detected including street lighting cables. The SGV4 Signal Generator can apply the dual frequency signal without direct connection to buried services, using either a Signal Clamp or the simple induction method from ground level, providing a significant improvement in the detection of the smaller diameter or poorly earthed cables. The fully adjustable One Watt Power Output of the SGV4 means that deeper and less conducting pipes and cables can be effectively energised and then traced over ever longer distances. It also features a FOUR position power level adjustment so the operator has total control of how much power is in use and when. A Pulsed or Continuous signal output allows operators to switch to the Pulsed Mode at the push of a button in high interference situations and keep on tracing. The SGV4 has a clear audible signal output to indicate when it is in operation. To compliment and support in-built data logging on the Cable Avoidance Tools, the SGV4 Signal Generator also has full data logging capability. A years worth of data can be stored, in normal usage, on both the Locator and Signal Generator. This can be conveniently transferred at any time via a USB to a supervisors PC for analysis. The SGV4 Signal Generators do not require periodic recalibration. A fully Automatic Daily Self Test (ADST) tests and confirms that they are functioning at their optimum level each day. The SGV4 Signal Generators perform a comprehensive Automatic Daily Self Test (ADST). The SGV4 has a large, clear and easy to read backlit LCD mounted behind a protective polycarbonate lens. The display indicates functions selected, power level, connection quality and battery condition. It also displays the Automatic Daily Self Test results. The SGV4s twin wall construction is robust and durable. It also provides IP65 standard protection against dust and water ingress. The SGV4 Signal Generator has a large detachable accessory tray as its base. It can house not only the standard accessories (Direct Connection Leads, Earth Stake, Connection Magnets, 10m Auxiliary Earth Lead) and the Instruction Manual but also many of the optional extras such as Signal Clamps, Sondes and Signal Injectors.